My second blog post in my ‘Beauty Besties’ series for the year of 2013. I posted my top 5 skincare products late last night, you can check it out here. Choosing only 5 body care products was not as easy as I thought it would be, especially since I am a LUSH addict. Soap & Glory products are also a new obsession of mine, so I had a hard time just sticking to 5 products. These are my best of the best, my top of the pops but to be honest, I could go on for hours mentioning all my other favourite body products. So, grab a cup of tea or coffee…and let’s get started! LUSH Whoosh Shower Jelly – this little tub was mentioned in my ‘September 2013 Favourites’ blog post. I love it so much, I bought 2 full size tubs (one Whoosh and one Sweetie Pie) the last time I visited LUSH. The scent of this shower jelly is just so refreshing and invigorating, the perfect wake-me-up on an early morning. Plus, what’s not to love about the fact that it’s a wobbly jelly? Retails for R 55,00 (100g) and R 95,00 (240g) at LUSH stores or the LUSH online store. SOAP & GLORY The Breakfast Scrub – smells sooooo good! Also mentioned in a previous blog post here, I cannot get enough of this scrub. It’s like scrubbing your body with cookie dough and is not too abrasive (but still gets the job done). At the end of my scrubbing session I kind of want to lick my skin. Retails for R 199,95 on the Rubybox online store (sold out at the moment). LUSH Butterball Bath Bomb – boy, was it a struggle to narrow down all the bath bombs, bath ballistics, bath melts and bubble bars to just 1 favourite! 2013 was the year I fell in love with LUSH and Butterball was my first LUSH product I tried and is the reason I fell in love with LUSH in the first place. So Butterball deserves the crown! Vanilla, musk and skin protecting cocoa butter ensures your bath water is deliciously moisturising and leaves the skin feeling super soft and nourished. Retails for R 29,50 at LUSH stores or the LUSH online store. The Body Shop Honeymania Body Butter – I’ve also mentioned this body butter quite a few times here on Pink Peonies. The scent is not as sickly sweet as you would expect from a honey-scented product, but that’s because it contains community fair trade honey harvested from the nectar of wild flowers. So your first whiff is a beautiful floral scent (top note) and somewhere in the mix the scent of honey lingers. I love this body butter because it does a great job of moisturising the skin, but doesn’t leave the skin feeling oily. Plus, the scent is quite long lasting and almost smells like you are wearing perfume. Perfection. Retails for R 140,00 at The Body Shop. 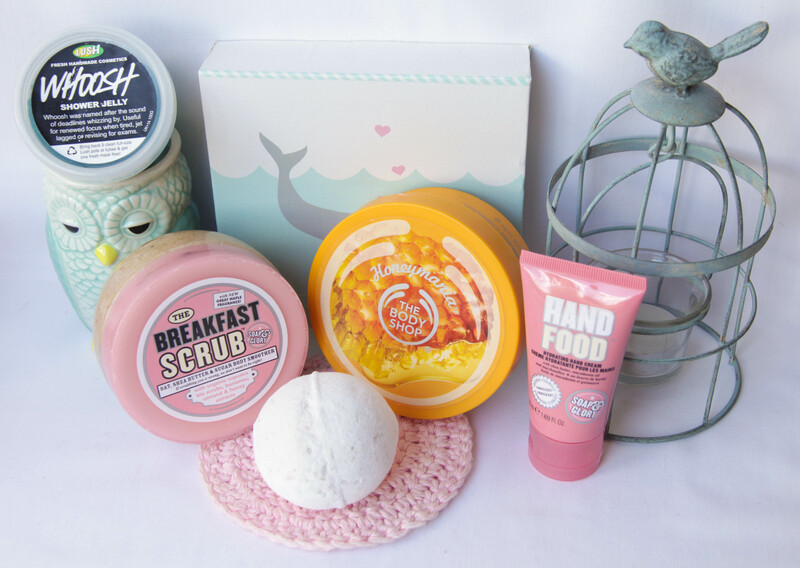 SOAP & GLORY Hand Food – I only just noticed I have 2 Soap & Glory products in this post – oops! But alas, the heart wants what the heart wants (and my heart is set on this hand cream). I mentioned this in my ‘November 2013 Favourites’ blog post and I ended up putting one in Neal’s pillow case (Christmas stocking) because he loves it too. The scent is similar to that of Miss Dior Chérie and it moisturises like it’s nobody’s business. Hands down the BEST hand cream I have ever used (and probably will ever use!). The hand cream you see in the photo above is a travel sized one I received in a gift set (the full size one is sitting on my bedside table). Retails for R 169,95 on the Rubybox online store. Next up in my ‘Beauty Besties 2013’ blog roll is makeup products – better stock up on snacks and beverages because it’s going to be a long one! I hope you guys are having a lovely Thursday! I’m thinking of doing a ‘New Years Resolutions’ blog post but I’m still mulling it over in my head. I’m hesitant because 1. I might look back at the end of 2014 and think: “Wow, what a fail.” And 2. Some of my resolutions are personal. Hhhhmmmm, I’ll think about it for a while longer. Yay!!!! your back. Hope you had a lovely Christmas and NY! Thanks, Stephanie! I hope you guys also had a wonderful Christmas over there! My bf got me the Honeymania gift set for Crimbo thanks to your recommendation – I luv the body butter, L! I will wait for the S&G scrub to be back in stock on Rubybox and will then place an order for both these products, the packaging is divine. Great stuff, so happy you’re enjoying your Christmas goodies! I have been missing my Pink Peonies fix heheh!! UGH! I am a huge LUSH addict as well. Have you tried Ceridwen’s cauldron? It’s a bath melt…it’s a little pricier than their others, but it’s soooo moisturizing, it’s surprising how good it is. No, never tried it before although I REALLY want to! I can’t order it online because they won’t send it via postal service (some of the bath melts can’t be posted), so I’ll have to wait until I’m on holiday in Cape Town again. It’s definitely on my ‘to get’ list! I’ve recently just bought Whoosh, The Breakfast Scrub and Hand Food. Agree with them being “besties” already! Yay, I’m so glad you’re trying out the products! They’re pretty awesome, aren’t they? What a wonderful blog, I only just discovered it and I’ve already spent so much time reading through your older blog posts. Lush Butterball is incredible, I totes agree! Wow, thank you so much for your kind words Kelly. I’m so happy you like my blog! I love the Honeymania range from Body Shop! Good post! So many products I want to try!! You have so many goodies here Luzanne! All of the YT vloggers I watch RAVE about the Soap & Glory Hand Food cream, sounds like it’s a definite must try! !